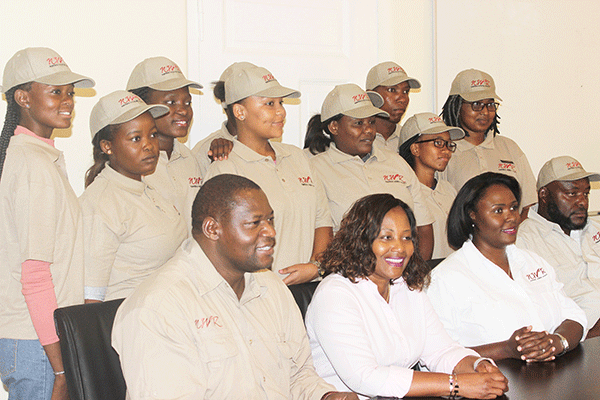 NAMIBIA Wildlife Resorts (NWR) last Friday sent a group of 10 young people to South Africa for a year-long study in hospitality at the South African College of Tourism in Graaff Reinet. The initiative is sponsored by NWR and Peace Parks Foundation, a non-profit organisation based in South Africa that facilitates the establishment of trans-frontier conservation areas. The youths were chosen from the Hai-//Om San and Ovahimba communities. This is the second time that trainees have been sent on the programme. The initiative was originally offered to only five young women, but this year a young man from the Ovahimba community was also included among the 10. Bidding the group farewell, NWR managing director Zelna Hengari encouraged them to work hard and to “make Namibia proud”. The youth were selected from marginalised communities in Namibia. NWR works with traditional authorities to select the final 10 youths. Last year's group graduated from the South African College of Tourism with certificates in hospitality. They joined five other South African youths on the course. The Namibian spoke to one of the graduates from last year's group, Victoria Thirion (21) from Karasburg. She was granted an attachment to the five-star Drostdy Hof Hotel in the Eastern Cape to work for them for a year. If she does well, she could be sent to Italy. The other three are currently doing their internships at Gross Barmen, while the fifth dropped out. Thirion is the eldest of five siblings. She says the entire experience was “quite exotic” for her. Her parents were teary-eyed and proud of her when they found out that she was accepted. They constantly encouraged her to work hard in her programme. “When I went there, I did not go for myself, but for my country, my community and for my people as well,” she beamed. Thirion added that she enjoyed all her subjects, but preferred culinary art more. This initiative is part of a developmental programme in Namibia and South Africa, based on the mandate NWR received from the two countries to develop tourism in the region. It aims to empower marginalised women with the necessary skills to work in the hospitality industry.